USC Price School of Public Policy Associate Professor Annette Kim had a vision to bring the seemingly disparate areas of art and urban planning together. She brought that vision to fruition by starting the Spatial Analysis Lab (SLAB) at USC. 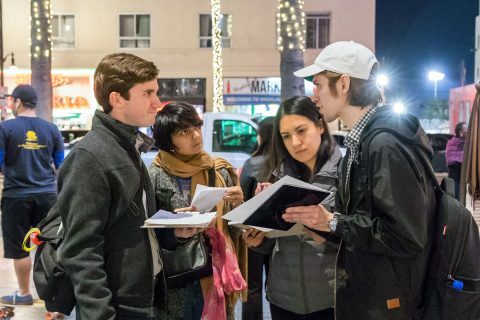 The lab’s first major event, a three-part series titled “Urban Visions: Art as Social Practice,” explored the ways in which ubiquitous elements of city life somehow seem invisible. 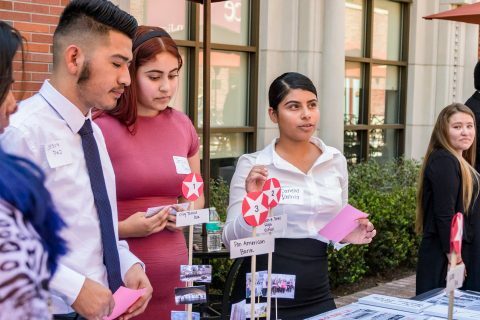 The series, which recently took place in collaboration with the USC School of Cinematic Arts and supported with a grant from the Visions and Voices initiative, featured a lecture from social practice artist Rick Lowe and a workshop with a digital media arts exhibition. Lowe received a MacArthur “genius” grant in 2014 for his work combining art practices with urban renewal to revitalize neglected neighborhoods. Lowe first brought his artistry to community development in 1994 at Project Row Houses in Houston, where he took 22 small, rundown shotgun houses that were otherwise going to be torn down and turned them into other uses such as transitional housing for single mothers, artist residency spaces and educational programs. Project Row Houses transformed the neighborhood as well as the residents. He challenged the single mothers to think of themselves as a work of art, sculpting their own lives every day with the choices they’re making. As an artist doing housing, … the ultimate plan is to create something that can resonate in a symbolic way with people. “Trans.lation” in the Vickery Meadow area of Dallas is another Lowe project. This neighborhood was considered dangerous to walk around and where the diversity of the people created fear and misunderstanding. His project started with community dinners accompanied with interpreters so that neighbors could better communicate with each other. The magic he witnessed through this interaction led to other community events such as asking people to bring the food from their culture for a neighborhood potluck, then a neighborhood talent show. Later, they placed 12×12-foot white cubes throughout the neighborhood that community members could use for art exhibitions. 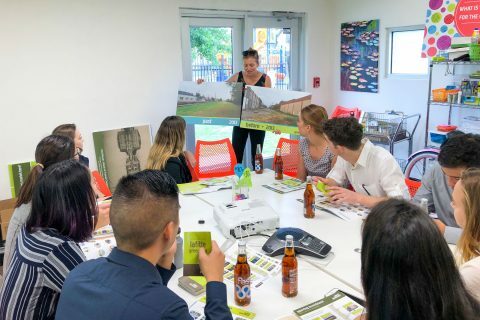 In the Opa-Locka area of Miami, Lowe soon hopes to take his artistic community approach to another level with a public-art project that has a goal of integrating art into the every-day experience, engaging residents and business. They would train people to paint and decorate their properties, serving as facilitators and teachers to help them give their neighborhood a new aesthetic identity. Unleashing the creativity of a community to me is the most incredible and valuable part of the work I do. In addition to the lecture, Lowe led a workshop for participants to discuss their own ways to bring art into the community. Kim presented her own cinematic-map project on street vendors working the sidewalks of Ho Chi Minh City in Vietnam as one of the four exhibits using art practice and digital media to re-narrate the every-day, lived city. 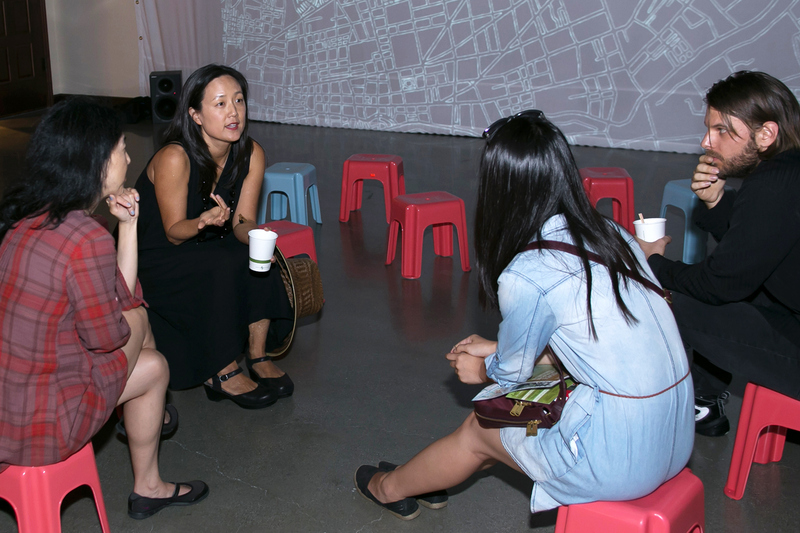 Kristy Kang, who serves as associate director of SLAB, offered an interactive Web platform providing the sights and sounds that tell the story of the cultural history for the multiethnic identity and development of LA’s Koreatown. Two representatives of the USC Annenberg School for Communication and Journalism filled the other walls of the exhibition. Associate Professor François Bar offered a collaborative map of healthy food and activities in South Los Angeles. Doctoral student Nonny De La Peña used an Oculus Rift to immerse people in the experience of having a diabetic man collapse into a seizure in front of them because of a blood-sugar drop while waiting in the long lines of a food bank. 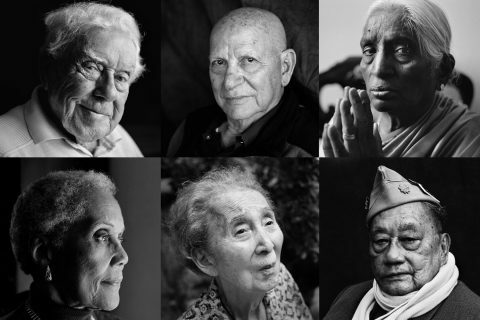 The USC Leonard Davis School of Gerontology exhibit conveys the beauty and dignity of age, encouraging people to examine their own place in the world.